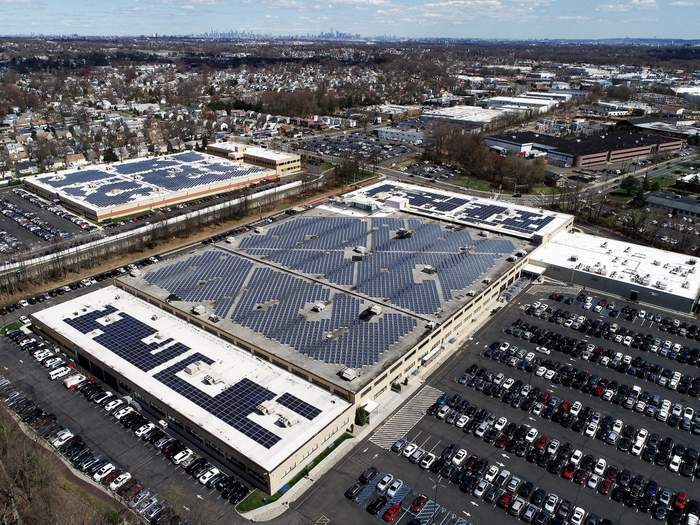 In 2010, SunPower installed a 1.2-MW solar power system at the Bed Bath & Beyond headquarters in Union, New Jersey. One decade later, with over 21 megawatts of SunPower solar deployed at 41 locations across six states, Bed Bath & Beyond is continuing to expand its commitment to renewable energy by adding a nearly 500-kW SunPower system at its corporate office. To date, the Bed Bath & Beyond 41 SunPower systems have generated over 125 million kWh of solar energy, offsetting over 88,000 metric tons of carbon dioxide emissions. Over their 25-year lifespan, it is expected that these solar projects will produce over 1 billion kWh. As Bed Bath & Beyond celebrates their 10th Earth Day as a beneficiary of clean, solar energy, the company’s commitment to renewable energy remains strong. Solar power is good for the environment, while providing cost savings benefits as well, which allows improvements to operations that help Bed Bath & Beyond better serve their customers. In 2017, Bed Bath & Beyond ranked 12th for corporate solar users in the U.S., reflecting the company’s commitment to offsetting electricity consumption with renewable solar power. While solar adoption in the U.S. ticks upward according to the U.S. Energy Information Administration, SunPower continues to capture a large share of the distributed generation solar market. In Wood Mackenzie’s latest U.S. PV Leaderboard report made available this month, SunPower remained the No. 1 provider of commercial solar solutions for a second year running. In addition, the company remained among the top residential solar panel manufacturers for the second consecutive year. An innovator in the space, SunPower is focused on being the top distributed energy company in North America. SunPower focuses on integrating its high performance solar systems with storage and intelligent software to deliver maximum value to customers, including demand charge savings, monitoring, data analytics and optimization, energy management and over time wholesale grid services. As a result, SunPower has a commercial solar installed base of 1.6 GW across its unique go-to-market platform of direct and indirect channels, with a number of Fortune 500 customers. Eight of the top 10 corporate solar buyers in America identified by the Solar Energy Industries Association are SunPower customers – including Ikea, Macy’s, and Target – contributing to SunPower’s position as the market share leader. To date, the company has installed 9 megawatt hours of storage at over 20 customer sites. Last year, SunPower’s U.S. residential business saw annual deployment growth of more than 15 percent bringing the total number of American homes with SunPower solar to over 236,000. 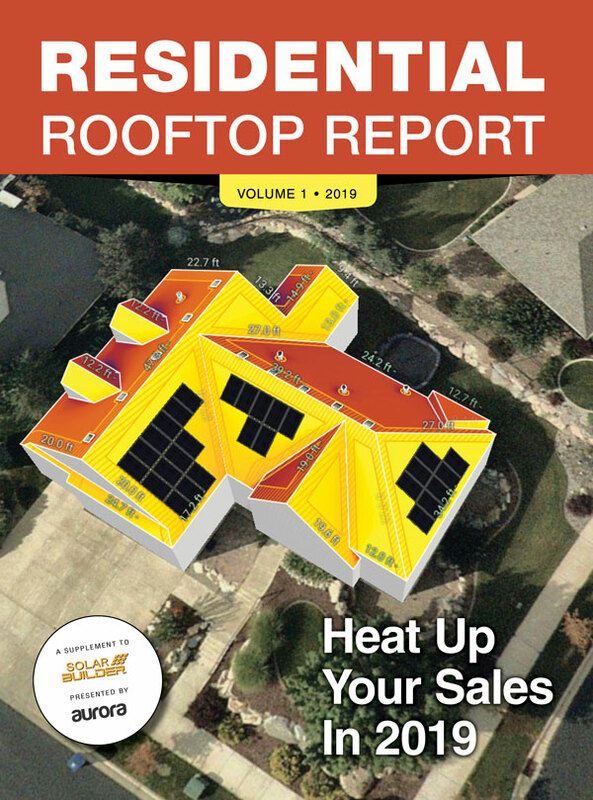 The company expanded its position in the new homes channel, partnering with 18 of the top 20 California new-home builders; and earlier this month, launched its A-Series panel to deliver up to 415 watts for U.S. homeowners. 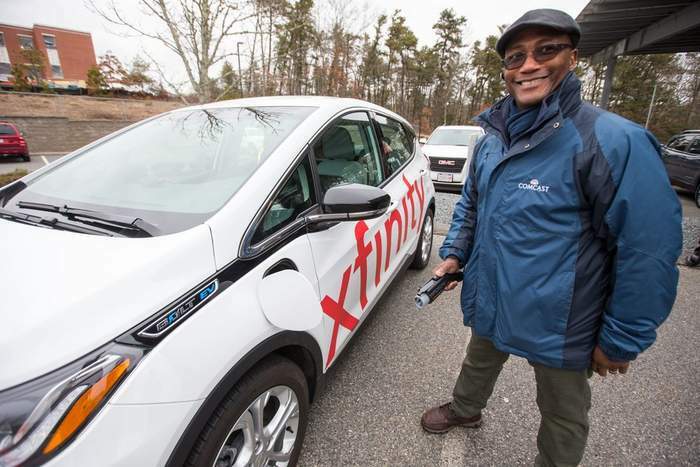 Kim Willingham, Senior Manager of Safety for Comcast’s Greater Boston Region plugs in an electric vehicle (EV) for charging at the newly completed solar carport installation in Plymouth, MA. Comcast completed a 1,170-panel carport solar installation that will help power its regional call center at 35 Resnik Road in Plymouth, Mass.. The system will generate enough onsite clean energy – as much as 600,000 kilowatt hours of power annually, or the equivalent of 60 homes’ worth of electricity – to offset more than 95% of the facility’s annual energy consumption. Comcast worked with Sunpower to install the parking lot-based solar array, also enabling the installation of two dual-port EV charging stations beneath the solar panel canopy, with the ability to charge four vehicles simultaneously. The system provides the added benefit of providing covered parking spots for employees during inclement and hot weather conditions. Local residents are also welcomed to use available EV car charging stations as well. Leading up to the solar system installation, Comcast converted its Plymouth facility to LED lighting, as it has done at numerous New England sites. This holistic approach to energy management delivered increased efficiency and eliminated more than 200,000 kilowatt hours of power usage annually at Plymouth. “Technology, innovation and talent are at the core of everything Comcast does, and generating clean energy on site at our Plymouth facility demonstrates our commitment to a culture of sustainability to promote a cleaner, healthier environment,” said Tracy Pitcher, Senior Vice President of Comcast’s Greater Boston Region, which serves customers throughout eastern Massachusetts, New Hampshire and Maine. The Plymouth solar project is the latest in an ongoing series of sustainability efforts implemented in Comcast’s New England footprint. Just a few examples include upgrading to high-efficiency equipment and cooling systems in data centers and installation of LED lights and fixtures at dozens of its largest offices and call centers including Manchester and Hudson locations in New Hampshire as well as Massachusetts facilities in Chelmsford, Malden, and Plymouth. Also, five EV charging station sites have been installed across the area with more planned for 2019, and the company is expanding its use of single-stream recycling and kitchen waste com-posting. For example, the company’s X1 platform enables customers to say “Go Green” into their voice remotes, leading them to a settings menu that launches a power-saving mode to power down the TV box when not in use. This helps customers reduce their energy consumption and saves money on their utility bills. In October 2018, SunPower acquired the SolarWorld Americas facility in Hillsboro, Oregon, making good on its commitment to invest in American manufacturing. 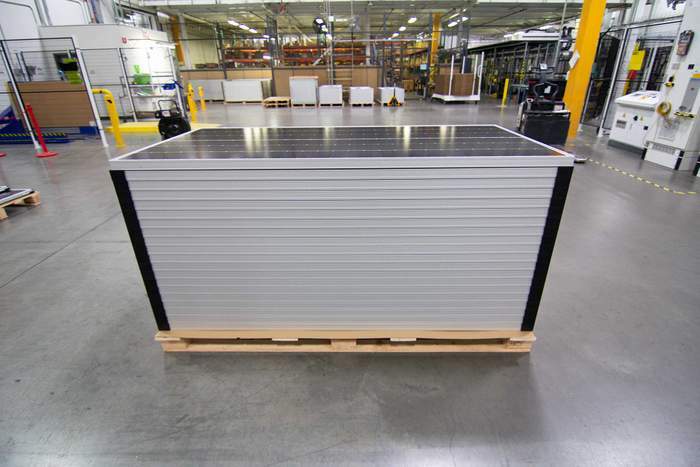 Just four months later, SunPower is assembling its 19 percent efficient Performance Series solar panel (P19 or P-Series) for commercial customers in the U.S. factory, leveraging U.S.-made automated stringing equipment and a workforce of about 200. SunPower will begin fulfilling commercial customer orders and shipping P19 solar panels from Oregon in the coming weeks. Several high-ranking Fortune 500 companies, an auto dealer in Texas, and a church in Missouri are just some of the customers who will soon benefit from SunPower panels that were assembled in America. 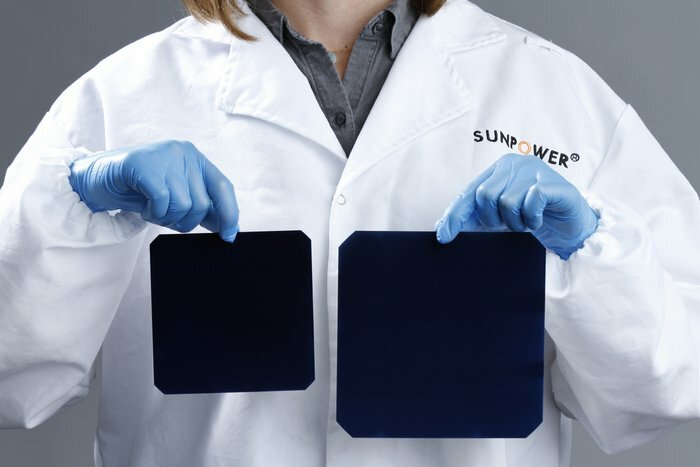 Incorporating P19 into a comprehensive high-efficiency product portfolio that includes SunPower’s Maxeon®-based X- and E-Series solar panels – as well as the company’s newly-developed Next Generation Technology coming this year – will enable SunPower to stay at the forefront of PV technology production. SunPower’s P19 solar panel architecture leverages a unique cell interconnect technology developed by a U.S.-based company called Cogenra Solar and funded in part by the U.S. Department of Energy (DOE) SunShot Initiative. SunPower acquired Cogenra in 2015 and introduced P-Series solar panels that same year.